We're fast approaching yet another weekend in the British Wrestling calendar and once again we are taking a look at just a small selection of the shows taking place. Let's get Ready For The Weekend! Up first on Friday night, Scottish Wrestling Alliance are at The Lagoon Centre in Paisley, Glasgow. The event shall mark the Scottish debut of 'The Aerial Assassin' Will Ospreay. 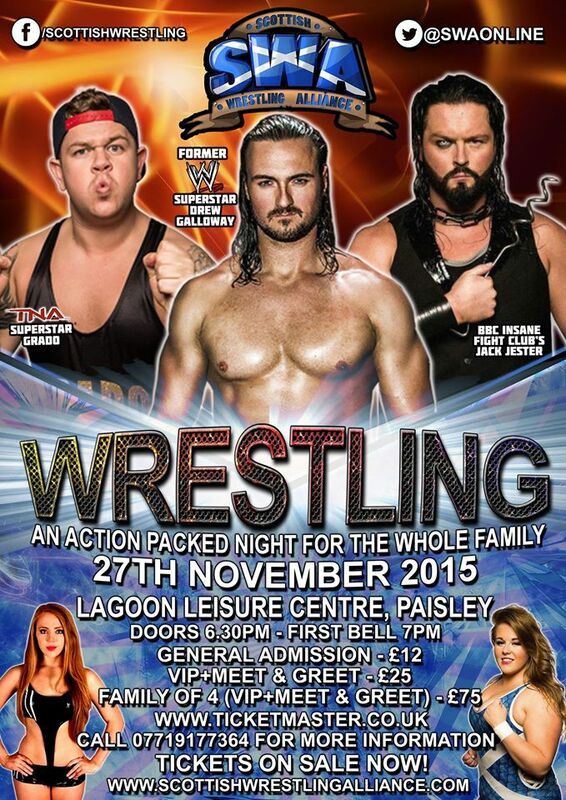 And what a début he is in for as he faces 'Scotland's Best Young Wrestler' Lewis Girvan. Will Ospreay has been tearing it up all over England as well as participating in this year's Pro Wrestling Guerilla's BOLA tournament. Lewis Girvan has not been having a quiet year himself as he has competed against some of the finest athletes in Scotland today including Drew Galloway. Ospreay will no doubt impress many new fans on Friday night as he makes his Scottish debut but he's facing the very best that Scotland has to offer in young talent. This match could be the match of the weekend. When speaking about the best that Scotland has to offer, a name that is often in any person's list is Mark Coffey. While often seen as part of Polo Promotions, Mark Coffey is not called 'The Real Deal' for nothing and is accomplished in singles action as he is in a team. On November 27th he will get a chance to prove that as he challenges Drew Galloway for the SWA Heavyweight Championship. Galloway won the championship in this very venue in Paisley. We could see another champion crowned on Friday as Mark Coffey will bring his A-game and give Galloway everything he has. The main event shall see Grado facing Mikey Whiplash. A must-see match for any wrestling fan. However, this match will have an added dimension as it has been announced that Gavin 'Boaby The Barman' Mitchell from hit BBC comedy show, Still Game shall be the special enforcer for this match. Grado will have the fans well behind him in Paisley but he faces one of the best technically sound wrestlers in Whiplash. Mikey Whiplash is as smart as he is dangerous and Grado will need to stay one step ahead of him to have a chance at picking up the win. Moving on to Saturday and Shropshire Wrestling Alliance are back at the Dawley Town Hall in Telford with 'GoldRush 2015'. The evening will feature two championship matches, one involving a ladder and a rumble to crown a new number contender. As we said their will be a championship match involving a ladder. The championship in question is the SWA British Lions Championship. Tyler Bate has been a fighting champion since winning the championship. This match will be his greatest challenges as he face not one but five other opponents in the shape of Mark Andrews, Nixon Newell, Drew Parker, Chris Brookes & Mike Bird. Any one of these challengers would be a worthy and challenging opponent. Add in the fact that ladders will play a vital part in the outcome of the match and really anyone could be working out of Telford as the SWA British Lions Champion this Saturday. The other championship on the line on November 28th will be the SWA Heavyweight Championship. Dan Moloney made his intentions clear at 'British Lions 2015' when he attacked reigning champion, Ryan Smile after the main event. With Moloney in possession of a guaranteed championship match, SWA had no choice but to grant the 'Super Beast' his demand. While Moloney will look to deliver another beating to The All Day Star and take the SWA Heavyweight Championship, Smile shall be out to gain retribution on the blind-sided attack that he received the last time that these two men were in the same ring. Saturday night will witness former tag team partners come face to face in a match. Chris Ridgeway and Damian Dunne are both on a quest to pick up a big win in SWA. These former partners did not part on good terms so there may be a little more spice in their offence against each other. There is a lot for both men to prove. Who is the better man and who will finally get the win they desperately want. Finishing the weekend, Kamikaze Pro are at the The Cadbury Club in Birmingham with a stacked show where every championship will be up for grabs. One title on the line will be the Kamikaze Pro Championship as Robbie X will defend against Juventud Guerrera. Robbie X has been a fighting champion for over a year now. His opponent, Juventud Guerrera has held championship in almost every company he's wrestled in. Robbie has defeated some of the best in Kamikaze Pro as well as those from further afield during his reign. He faces as big a challenge as any now though in the former IWGP Junior Heavyweight Champion, who will look to add to his impressive list of accolades. November 29th will see one man who loves to cheat face a man who loves violence. This Sunday will see Marshall X faces Clint Margera in a no disqualification match. Marshall X is renowned for cheating during matches in any way he can. That won't be an issue for his when he face Clint Margera as he can do anything he wants. While that would normally be of benefit to Marshall X, his opponent Clint Margera is a man who will do anything. He is a lover of violence and the use of weapons. Marshall X may find that he's against a man who likes do anything it takes to win more than even he does. The main event for 'Frost Fight 3' will see 'The Man Beast' face 'The Super Beast' as Rhyno competes against Dan Moloney. Dan Moloney is the current Money In The Bank holder and has continued to get better as Kamikaze Pro has grown. He's now one of the promotion's top athletes. His opponent needs little introduction as a former ECW Champion and a current member of NXT. Rhyno is still as impressive as he ever was and will bring Dan Moloney a challenge that he has rarely faced before. However, Moloney will look to show Rhyno that there is room for only one beast in Kamikaze Pro and he's not planning on giving up that place any time soon.